Muddy Water was our next single release. We went to the office to collect the demo. We really liked this song. It had already been released in America in 1969 by a Band called The Balloon Corps. 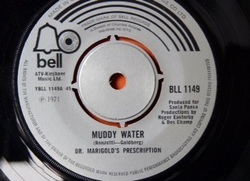 The only information on the record label was Muddy Water ( Renzetti-Goldberg ). I discovered more about The Balloon Corps about three years ago. I have been in touch with two of their members, Bob Hummel (Guitar/Vocal) living in North Carolina and Charlie Walsh (Drums) living in New Jersey. They were based in Philadelphia when making records in the 60's,and evolved from a band named The Snaps. The story I really like about The Snaps is when playing a gig at The Fairview Club in New Jersey, they refused to stop playing at the allocated time. The cops were called, the band members arrested and thrown into the county gaol. A similar occurrence happened in England last year but with a different outcome. Bruce Springsteen's set in Hyde Park overran, the authorities turned off the electricity. Joe Renzetti wrote and produced the version by The Balloon Corps. I would describe the style of that version similar to a Creedence Clearwater Revival song. Joe Renzetti went on to greater things as he was awarded an Oscar for Best Adaptation Score for the music in the film, The Buddy Holly Story. Of course the music was Holly’s but Joe taught the actors to act with the instruments and when he thought they were ready, had them filmed in live performances which apparently had not been done before. Our version of the record was due to be released on Bell EMI, our second on that label. The song seemed to have a serious message. We thought it was about the aftermath of a nuclear explosion, if that is so, it may have been more suited to a decade before but we weren't sure. I have spoken to The Balloon Corps drummer Charlie, he didn't know what the song was about either. We gave the song more of an upbeat feel than the demo, playing with more strength which fitted alongside Fred's powerful voice. The original version had a laid back feel. We settled in more easily at Trident Sound having been there to record Sing Along the previous year. The feel we got from this session was amazing. Fred led the line with his soulful voice. This time I thought the piano sound was the best I ever had on record. All credit to the sound engineer. I suppose you could say we turned the song around to give it a chance in the pop charts. We had real hope with it. The B side was a nice little song written by vocalist Fred. It was "Come With Me" and has some very good lyrics. Well worth a listen on You Tube. All our single releases can be found on You Tube as one of our fans spent hours entering them for all to hear. Again the record was given massive amounts of airplay on Radio1. DMP were beginning to become a household name without success. We had an appointment to do some filming for one of the early Kenny Everett shows. I think it was The Kenny Everett Explosion. We met up with the location team and headed out on to the M1. The weather was overcast and raining so we weren't hopeful as plenty of light was needed for filming. We followed the team and found ourselves parking up at an electricity substation. It was a wasted journey really because after doing some posing whilst climbing over concrete it was decided for us to drive back to ATV Studios in Wembley London. Once inside a small studio we were instructed to set up our instruments, ready to be filmed in action, the record playing in the background. That never worked either so we went home none the wiser. In the end the record was played on the show accompanied by a back screen of scratchy patterns. However this was a precious piece of publicity for us. We were to return to the same TV studios for an appearance on Whittaker's World Of Music hosted by the star himself. Other stars on that particular night were Mungo Jerry and Ashton Gardner and Dyke who had that great record Resurrection Shuffle. Surely Dr Marigold's Prescription would now have a great chance to advance. There was also a revisit to Shepherds Bush Theatre to record for another Basil Brush Show. Twice with the Fox, how could we fail? The Band were being booked more and more due to the release of the record and exposure on the Radio. We even started playing on the University circuit which was a lucrative source of income. Universities seemed to have limitless amounts of cash to pay for entertainment. We were getting around £100 total for a show, this far removed from the usual £30-£50. There was one venue where the audience took us into their hearts. It was The Robert Peel in Kingston, Surrey. Although still based in North London, we made a lot of friends here, most of them becoming great fans of the group and some are still fans today. The pay wasn't great but we needed this respite, what with all the travelling on the road. Other regulars playing The Robert Peel were Blackfoot Sue, whose hit was "Standing In The Road". At this time we were travelling from one end of the country to the other and life on the road could be a struggle. We were often double booked with other groups. I remember on one occasion driving to Rutland in the winter season. It had been snowing for days. We chanced our lives in these conditions but there was a contract signed and the show had to go on. The venue was RAF Oakham. Unbelievably we were doubled booked with a hypnotist. As the weather was terrible we had to stay around and watch his show. Quite an eye opener. That night we had to sleep in the van, freezing cold and so uncomfortable. The only thing to look forward to was breakfast in the canteen. We were out of pocket and feeling miserable. We had a rehearsal with John Walker of The Walker Brothers. This was back at The Castle in Holloway Road, N.7. There was only one gig to play, in the grounds of a Country Mansion in Leicestershire. The marquee was already built when we arrived. It was raining heavily. 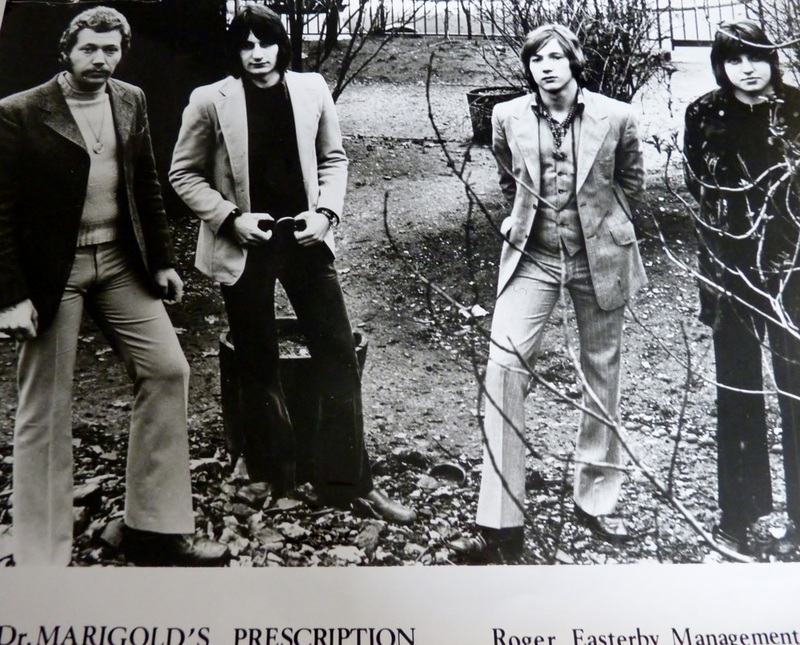 There were some bigs names for this gig, one of note; The Brian Auger Trinity. The rumours began. There was word that because of the bad weather the promoter was about to do a runner. I don't know if he had the ticket money or not. We all scarpered very quickly. In those days an entry into the Top 40 was essential, as it would guarantee a play on Top Of The Pops. I can't say how many records we sold but Muddy Water just fell short of that Top 40 spot. This was a disappointment, but it didn't deter us. Our next record was written by an extraordinary song writer. On top of this we used another studio hoping our luck would change for the better.